/Desktop /Where is the settings for Turn Off the Lights for Desktop software? 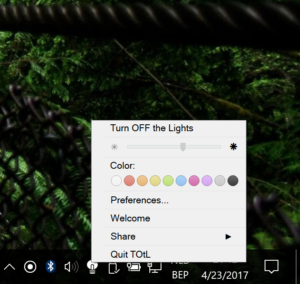 The settings for Turn Off the Lights for Desktop have many options to customize your screen dimmer experience. The Turn Off the Lights for Desktop (Windows Store App) have two kinds of settings panels. The first one, that is the quick setting menu. Here on this context menu, you change the color and his opacity value of this dark layer. The second, that the full options settings window where you can change all the features in the Turn Off the Lights for Desktop Windows Store app. The first way is to do the lights off on your computer desktop. This by clicking on the white lamp button. Then click right on this white lamp icon. You see that a new context menu show up. Here you see a slider bar to increase or decrease the opacity value. But also the color circles to change live the color layer on your screen. Right click on the white lamp icon right of the Windows clock. And click on the menu item “Preference…”. The settings window will show up, and there you can change also the opacity of the dark layer.